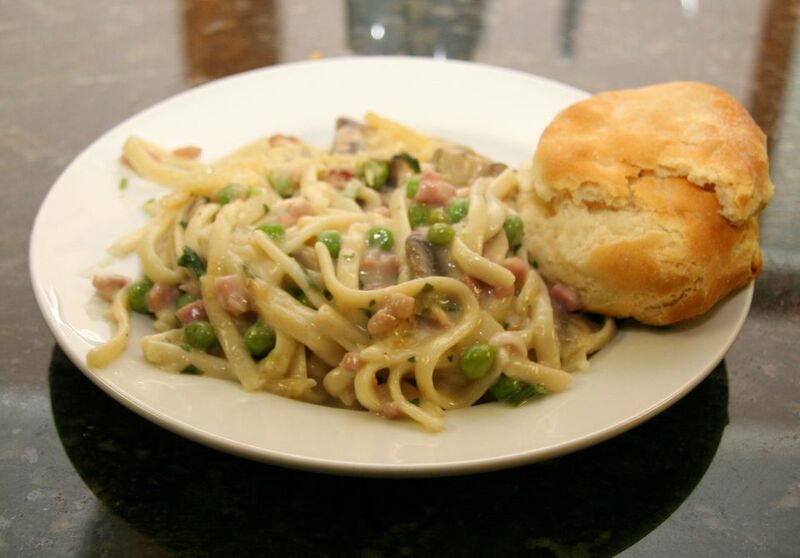 This casserole is a nice way to use leftover ham or use a ham slice or packaged diced ham. Serve this tasty casserole with a tossed salad and biscuits for a hearty everyday meal. Spray a 3-quart baking dish with nonstick cooking spray. Heat oven to 350 F.
Cook the spaghetti or linguine in boiling salted water following the package directions. Rinse, drain, and set aside. In a large sauté pan, melt butter over medium heat. Add the mushrooms, ham, green onion, if using, and parsley. Saute, stirring, until mushrooms are tender. Stir in flour until blended. Cook, stirring, for 1 to 2 minutes. Add chicken broth, sherry, nutmeg, if using, salt, and pepper. Cook, stirring, until thickened. Stir in cream or half-and-half, half of the cheese, and peas. Add the pasta to the sauce mixture and stir to blend. Turn into the prepared baking dish. Sprinkle remaining cheese over the top and bake for 25 to 35 minutes, until hot and bubbly.